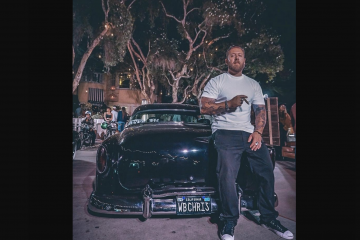 Civic Happenings: Oct 2, 4, and 17. Show up and be heard! 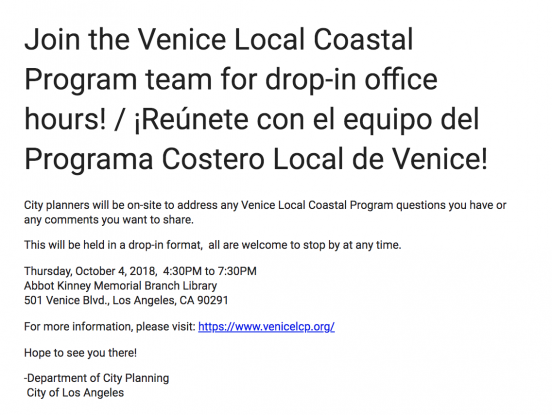 It is a busy month for the the City Planners, council members, and mayor regarding their plans for Venice. As residents we owe it to ourselves, and to traditional American values, to participate in this process and let those who we elected to serve us know how we want to proceed. The Dept. 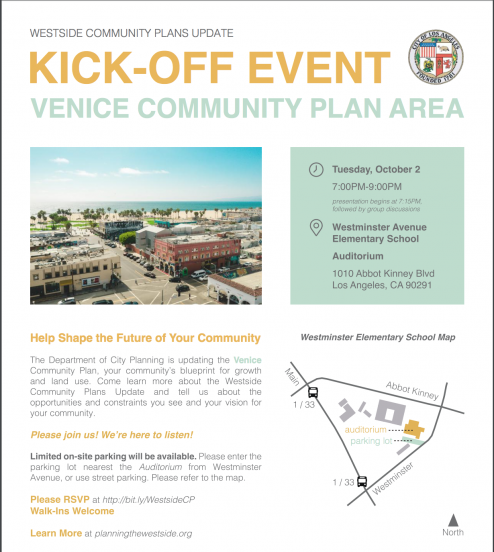 of City Planning is updating the plan for Venice. The meeting is Oct. 2, 2018 at Westminster Elementary at 7:00 p.m.
Click on flyer for more info! Next up on Oct. 4 is drop in hours from 4:30 p.m. to 7:30 p.m. with the Dept. of City Planning at the Abbot Kinney branch library. And this brings us to the big one, on Oct. 17 is the town hall on the proposal to build a homeless shelter at the MTA lot. Click on flyer to RSVP. 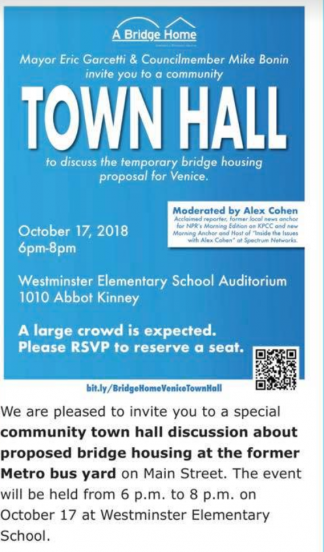 As there is a lot going on in Venice right now, this is probably a good time for you to participate. It is your Venice! Make those in power hear your voice! They work for you! Previous ArticleHama Sushi celebrates 40 years in Venice!